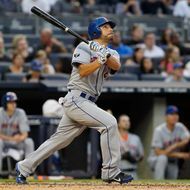 In the fifth inning of their game last night against the Rays, the Mets found themselves down 2-1 with two outs and the bases empty. The bookends of the batting order, Omar Quintanilla in ninth followed by Kirk Nieuwenhuis and Jordany Valdespin ("Spell Checkers' Row"? ), then reeled off three straight hits to give the Mets a 3-2 lead. Mustering that kind of offensive outburst with two outs seems special — one might even use the word "clutch" — but the Mets, as it turns out, have made it something of a habit (and they did it a second time last night with their huge seventh inning). Over at Capital New York, the excellent Howard Megdal dug into the Mets' two-out statistics and found some numbers unmatched by any other MLB team. Megdal's findings: 49 percent of the Mets' runs to date came with two men out. They've posted a .787 OPS with two out, which is considerably better than their output with one or zero men out. If you look at an even "clutcher" situation — two men out and runners in scoring position — the Mets have an even crazier .843 OPS, which is best in the MLB by a long shot and hasn't been matched in a few years. The Yankees would love a taste of that RISP-y magic. As Megdal notes, numbers like these only mean so much when the team is just 33-29, and they're bound to regress over time. Still, that's some pretty clutch performance, Mets bros.